As the slew of defendants prepare for their court dates and the Higher Ed Scandal takes up more space on social media, it’s an interesting time to be in the assessment industry. Although no one is really surprised that wealth was used to unfairly influence academia, what may surprise people is that professionals in the assessment industry are focused on issues of integrity and fairness on a daily basis. Our goal is to provide every student an equal opportunity to display their knowledge and skills, which begins with developing valid assessments and includes standardized test administration protocols that are designed to ensure every student’s score accurately reflects his or her performance. As such, activities that rob students of the success they legitimately deserve particularly disturb those of us who spend our days trying to create a level playing field for every student. So, how do we get beyond our disappointment and anger to ensure these types of scandals are less likely to occur in the future? A significant part of the answer is high-quality training programs for proctors. At the foundation of this recent scandal is unethical administrators and proctors who were involved in facilitating test-taker proxies (an alternate person to take the test) or in providing unauthorized assistance during the testing session to help students achieve a higher score. 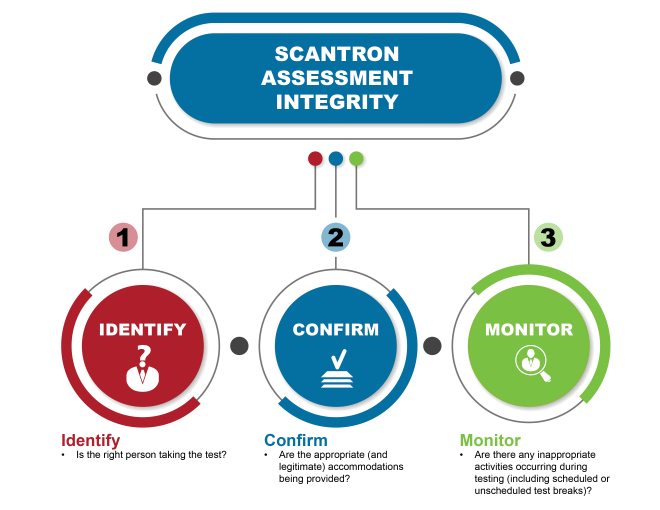 Test proctors are an essential part of ensuring fairness and integrity in the testing process. A proctor’s main job is to ensure one thing—that the score the student receives truly reflects their performance on the exam (versus reflecting an inappropriate advantage). With proctors playing such a vital role in the testing process, it is critical that they receive appropriate training. They must also demonstrate (through taking their own assessments) that they have learned the information necessary to do their jobs well. System-Specific Requirements: The software being used within a testing environment is intricately linked to the overall testing activities. Procedures for Different Testing Modes: Paper-based and computer-based testing requirements differ in administration and security protocols. Check-In and Check-Out Procedures: Identify verification, documentation review, biometrics (when applicable), storage of personal materials, etc. Test Monitoring: This includes not only behavior of singular test takers, but between multiple test takers and other proctors as well. Every Scantron proctor has to successfully complete their training and pass their assessments before obtaining their certificate. Only those proctors who successfully obtain their program certificate can be associated with high-stakes tests developed and/or delivered by our organization. By providing a standardized approach to all testing environments, we can help level the playing field for everyone and ensure talent, hard work and merit determines someone’s future—not wealth.